The pantry is organized to distribute food based on the “Choose My Plate” nutrition recommendations. 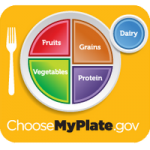 Every attempt is made to offer food choices from each of the five food groups at each pantry day. To offer the most nutritious foods possible, below is the list of foods we try to keep stocked in the Pantry. In addition, there are items noted for special dietary needs. Donations may be delivered to Hope Station during office hours (Monday – Thursday, 8:00 am – 4:00 pm; Friday, 8:00 am – 1:00 pm), and by appointment at other times. Arrangements may be made for Hope Station staff to pick up large collections of food. The items marked with (*) are particularly needed at this time. Special note: Area food stores make regular contributions of meats and breads that are distributed with the food items noted above. Books and Magazines are given to food pantry clients and shelter clients when they are donated to Hope Station for distribution.